Major changes have come to a relatively minor bit of HTML code, which had previously been the source of a lot of controversy: The humble 301 redirect, as well as other 300-series redirects. On its face, the 301 is an exceedingly simple piece of code. If one webpage has changed addresses, the 301 takes incoming requests for the old address and redirects them to the new website. This is usually done so quickly that the visitor often doesn’t notice that it’s happened. So what’s the big deal? Well, quite a lot. 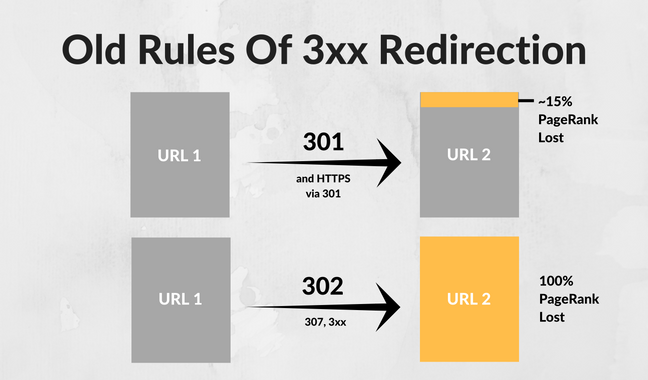 In this post, we’ll be taking a look at everything an SEO expert needs to know about 301, 302, and 307 redirects and how recent Google rules changes have altered their usage. This should be of particular interest to webmasters who are currently on unsecured HTTP sites, and are thinking about migrating to HTTPS but have worried about the technical difficulties. 301, 302, and 307 Redirects: What’s The Difference? This is the standard redirection used whenever a webpage has permanently changed addresses. You will almost certainly be using 301s more than any other type. 302s are an older HTML code to signal a temporary change in address. The most common application would have been if a site was under a major reconstruction, and the visitor-accessible site was moved to a secondary address until the main page had been redesigned. This is the modernized version of 302s, introduced in HTML 1.1. It’s functionally equivalent to 302, but is now the preferred method for temporary redirections. It also works better with interactive HTML elements, such as webforms. 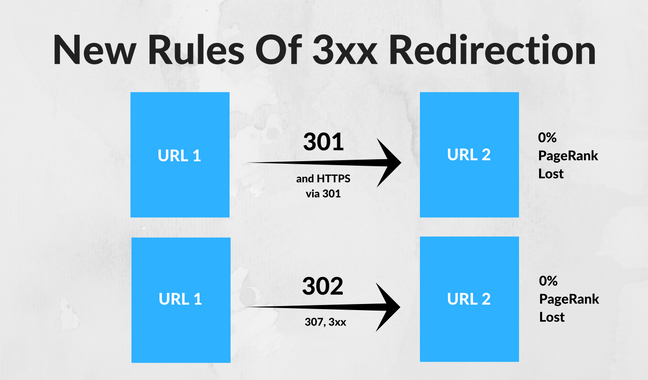 This guide will focus mostly on 301s, but we’ll occasionally mention how changes and strategies affect temporary redirects as well. So, why were 301 redirects controversial in the past? Because previously they brought about fairly significant PageRank losses in Google. This was most likely because there was a period, around 2010, where “black hat” websites would abuse 301 and 302 redirects heavily to trick visitors into visiting sites they hadn’t intended to. The penalty greatly reduced their visibility in Google. A very useful and often quite necessary HTML tool became shunned among webmasters who didn’t want to incur rank penalties. Worse, it began to work against Google’s own crusade to get websites to adopt secured HTTPS connections, because websites didn’t want to implement the 301s necessary to make the migration work. And 302/307 redirects were ignored entirely. In effect, there was a 100% loss of PageRank for any page reached via temporary redirect. So while before, a single 301 redirect could lose a page up to 15% of its PageRank, and temporary redirects got no PageRank at all, those penalties have apparently been removed entirely. Tests conducted by groups like Moz seem to confirm this. Webpages are now free to use 301, 302, and 307 redirects without directly incurring penalty. But does that mean you should start redirecting to your heart’s content? Not necessarily. Just as a general rule, there really is very little good reason to use 302/307 redirects unless it truly is temporary. Again, like doing major webpage maintenance. While it’s nice that Google won’t be penalizing pages redirected to with these methods, they should still be treated as a very rare redirect. If you’re going to use a 301, make certain that the page you’re redirecting to is substantially or entirely identical to the originating page. Google compares the content between the two pages, and the more difference there is, the more chance they’ll decide you’re trying to pull a ‘switcheroo’ like the black hat sites do. Also, it’s unknown whether Google is counting the number of redirects deployed. There’s still a good chance of having a penalty if you have multiple redirects stacked on top of each other. While the time taken in following a redirect is often invisibly minimal, that’s not always the case. This is especially true for users still on dialup, slow broadband, or older 3G cell networks. It’s still good practice to build websites with as few server calls as possible, specifically to improve load times and UX, which are also factors Google takes into consideration in ranking. Now, let’s summarize this into some key points to keep in mind when you’re planning your webpages for 2016 and beyond. Beyond all other factors, always keep in mind that there is still some risk in using redirects. There’s much less risk than before, but they should still be avoided when possible. Point 1 notwithstanding, if you’ve been dragging your feet on the HTTPS migration, this should be your signal to start working on it. HTTPS is safer for you and your customers/visitors, so there’s very little reason left not to make the switch. Plus, remember, Google is now rewarding websites with a small PageRank bonus if they’re using secured connections. There’s a chance you could actually increase your visibility by moving to HTTPS, even if it does mean using some redirects. At the risk of repeating ourselves, again, don’t use 302/307 redirects when a 301 would be more appropriate. There’s no benefit of using them for permanent page changes, and there’s a chance of Google penalizing you for abusing them. For numerous reasons, stacked redirects are a bad idea. From potentially looking like a black hat site, to annoying visitors on slow connections, do whatever you can to avoid redirecting a single request any more than is absolutely necessary. The page being redirected to should still substantially resemble the original page. Redirecting to a non-relevant page, or engaging in black hat games like creating a thousand pages which all redirect to your homepage, will still result in substantial –even crippling– penalties to your site. Whenever possible, change nothing about the page aside from its address. This is the best way to ensure no PageRank penalties. Always remember that PageRank isn’t everything. As we’ve mentioned elsewhere, there are still plenty of other ways that redirecting –especially multiple stacked redirects– can ultimately harm your search page placement. Remove multiple query parameters, cleaning up the URL. Improve your directory or subfolder structure. Include more keywords in the URL for SEO purposes. Switch to human-readable URLs, which is also good SEO. Finally, keep in mind that everything else discussed in this blog only applies to Google. Microsoft is a lot more secretive about their search ranking criteria on Bing, and it’s largely unknown how Bing does or doesn’t penalize extensive redirection. Far fewer research projects involve testing Bing rigorously. If you plan a major redirect project –like moving to HTTPS– you’re advised to use the Bing Site Move Tool to inform them directly, rather than relying on bots to update their listings. SEOPressor Connect is designed to make things easier for users. Instead of doing the 301 redirects manually, all you have to do is just insert the URL that you’d like your blog post or website to redirect to, and it will be done for you automatically. 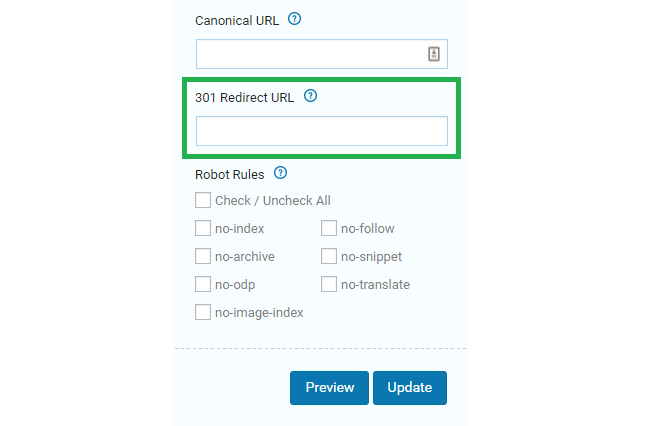 Here’s where you key in the 301 Redirect URL in SEOPressor Connect on where you want your website/blog post to redirect to. We also have tutorials on how to setup your on-page settings such as META settings, canonical, 301 redirect, and robot rules. Here’s everything you need to know about 301, 302, and 307 redirects in 2016 SEO strategies. 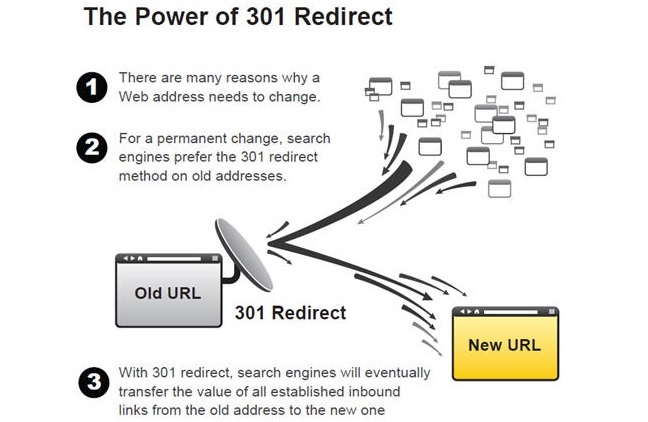 And by now you should understand the proper usage of 301 redirects in helping search engines and your visitors to get to your new content from the older links. Did we leave something out? What are your thoughts about the new rules for 301 redirects? Let us know in the comments below!